The number of Seattle-area homes bought through a Limited Liability Corporation (LLC) — a strong indication that the homes are investor-owned — have more than tripled since 2002. You can stop worrying about Seattle turning into the next San Francisco — and start worrying about us turning into the next Vancouver. Seattle just dethroned its Canadian neighbor as the top North American market for deep-pocketed Chinese homebuyers. And it’s not just China — investors from all over are eyeing the Seattle-area housing market, helping to drive prices even higher. While this trend may be suddenly accelerating, it’s not a new phenomenon. Analysis of King County assessor records shows that the number of residential homes held by a limited liability company (LLC) — a strong indicator that a property is investor-owned — began to escalate in the early 2000s, with the sharpest increases in the years before the recession. From 2002 to 2015, the total number of single-family homes and attached houses owned by an LLC more than tripled to 10,425 — about 2 percent of the housing stock in King County. “This is people buying homes for investment purposes,” said John Hempelmann, chairman of Cairncross & Hempelmann, a Seattle law firm whose practice areas include real-estate law. He estimates that 90 percent of LLC-owned homes are investment properties. “It doesn’t matter what country you’re from, if you are even a slightly sophisticated investor in single-family homes, you’ll buy it with an LLC,” he said. While there is a great deal of interest in the Seattle market among the Chinese, Hempelmann says that investors come from many countries, and from within the U.S. The assessor’s records do not indicate the country of origin of the LLC members. Homes owned by LLCs are spread throughout King County, and range from very modest to palatial. The average assessed value for LLC-owned single-family homes in Seattle was $560,00 in 2015. In Bellevue, it was $830,000. Hempelmann says investors from around the globe began to take notice of Seattle in the early 2000s. The biggest increase in investment homes happened during the housing-bubble era, when Seattle’s market was red hot. In 2008, just before the bubble burst, the number of LLC-owned homes jumped by more than 1,600. 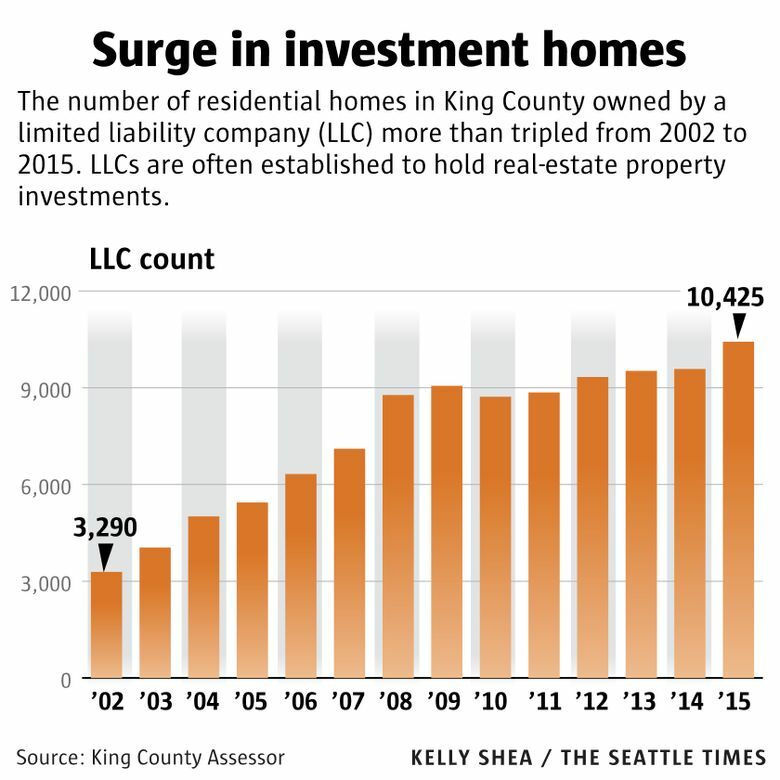 Last year saw the biggest spike in LLC ownership in King County since the start of the recession — an increase of more than 800 from the previous year. Investors buy properties through an LLC for a variety of reasons, the most important being the limit on personal liability for business debts and claims. And you get that corporate-like protection from creditors without having to pay a corporate tax. Another advantage of buying through an LLC is privacy. Individual names are kept off the property records, a feature that appeals to many foreign buyers. But if you’re interested in forming an LLC to buy a home, you’ll need to pay in cash, because a bank won’t lend you the money. So LLC home purchases are typically an all-cash deal, meaning banks aren’t involved at all. That simplifies real-estate transactions tremendously. “Most single-family home sellers, if they get the cash, they don’t care who the LLC is,” Hempelmann said.